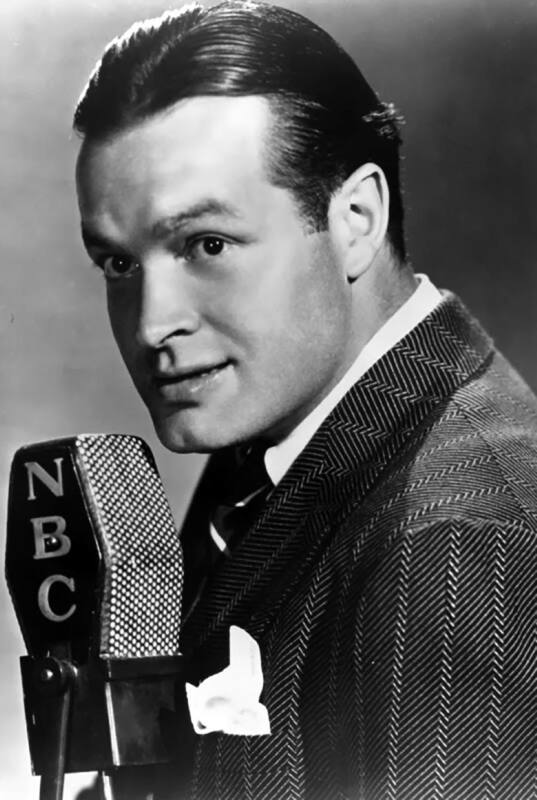 "20,000 Leagues Under The Sea Skit"
Before being a comedian, Bob Hope was a boxer known as Packy East. The Guinness Book of World Records lists Bob Hope as “Most Honored Entertainer in the World”. He is one of four people who have four stars on the Hollywood Walk of Fame (Gene Autry is the only person with Stars in all five categories), the Star at 6541 Hollywood Blvd honors his work in Motion Pictures, at 6758 Hollywood Blvd for Television, a Special Plaque at 7021 Hollywood Blvd for Live Performance, and a Star for Radio at 6141 Hollywood Blvd, and the intersection of Hollywood Blvd and Vine St was named “Bob Hope Square in honor of his 100th birthday. He has been friends and golf partners with Presidents, and awarded a Congressional Gold Medal, The Presidential Medal of Freedom, the Ronald Reagan Freedom Award, the National Medal of Arts and the Sylvanus Thayer Award from the US Military Academy. Alumni Hall at the Naval Academy is the home of the Bob Hope Performing Arts Center. Delores Hope commissioned T-AKR-300 the USNS Bob Hope in 1997, one of the few US Naval ships to be named for a living person. The Air Force named a C-17 Globemaster III The Spirit of Bob Hope. Queen Elizabeth bestowed him with an honorary knighthood for his contributions film, song and to the entertainment of troops (said Bob: “I’m speechless. 70 years of ad-lib material and I’m speechless.”). He has been awarded 54 honorary doctorates, but Bob would have been the first to point out that they were all “honorary” degrees. Interestingly, one honor which eluded him was an Oscar for his acting (“Oscar night at my house is called Passover”). However, the Academy has honored him with two special awards, two honorary Oscars and the Jean Hersholt Humanitarian Award. The honor for which Bob Hope is said to have been the most proud came on October 27, 1997, when by Act of Congress he was named an Honorary Veteran of the United States Armed Forces. With this honor, Bob joined a brotherhood which he had spent the greater part of his long career honoring, those serving their country. That, perhaps, was the secret of Bob Hope’s success, he never forgot that he was there for the audience, not the other way around. Hope was born Leslie Townes Hope in London, 1903, the fifth of seven sons and the scion of a stonemason and a light opera singer. In 1907, the Hope family immigrated to Cleveland, Ohio (“I left England at the age of four when I found out I couldn’t be king”). At the age of twelve, Bob, as he was called by his family, began performing on the streets to earn pocket money. He also worked in his uncle’s butchers shop, jerked sodas, sold shoes, hustled pool and appeared in amateur shows. At 18, he convinced his girlfriend to join him as a dance partner on the vaudeville stage. The act was a success for $8 a night, until her mother showed up at the theater one night. Bob continued in Vaudeville with other dance partners until an engagement at a small theater in New Castle, Pennsylvania. The regular master of ceremonies did not show up, so the theater owner asked Bob to introduce the acts. Seeing the audience response, the owner next encouraged him to stretch the intros to a full five minutes, and Bob became one of the most popular emcees of all time. In 1932, Bob was cracking jokes in the Broadway revue Ballyhoo. On June 8, 1933, Bob was invited to appear on The Fleischmann’s Yeast Hour (Rudy Vallee introduced him as a “promising young comic) and the next year he was in the musical “Roberta”. A friend from the cast of “Roberta” took Bob to the Vogue Club on 57th St to see a pretty singer named Dolores Reade. In February, 1934, that pretty singer became Dolores Hope. In 1937, Bob got his own radio show, signing for 26 weeks with the Woodbury Soap Show from NBC’s New York studios. After the contract wound down he traveled to Hollywood to appear in MGM’s The Big Broadcast of 1938. The movie gave him what would become his signature tune, “Thanks for the Memory”, and while in Hollywood he signed a ten year contract with Lever Brothers to host The Pepsodent Show. America made it a point to tune to NBC on Tuesday nights to hear Bob’s rapid fire humor. In the early spring of 1941, as America’s involvement in the European War was beginning to seem inevitable, Pepsodent Show producer Al Capstaff came up with the idea doing a remote broadcast from March Field, the Army Air Corps base where his brother was stationed. The network and the sponsor supported the idea, but most of all Bob was enthusiastic to try it, and it became a tradition. During the duration of WWII, almost all of the Pepsodent Shows were broadcast from military bases in the US, as well as in the European and Pacific Theaters. Even after the War, Bob had a crew of “gypsies” whom he could and did call upon to drop everything and join him on a USO tour to the other side of the world. In 1990, during the Gulf War, Dolores Hope became the only woman allowed to perform in Saudi Arabia. While other vaudevillians were rushing to the new medium of television, Bob held back, not convinced that it would last. While others struggled to maintain a weekly show on the small screen, Bob waited until Easter of 1950 to broadcast a special, and his decision not to have a weekly program on TV meant that when he did have a special, it was an event. 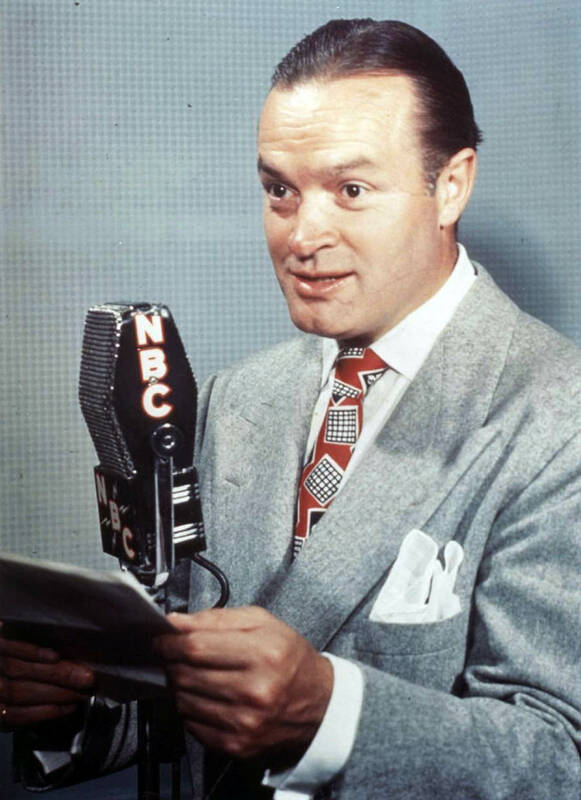 On May 29, 2003, Bob Hope turned 100, and the nation celebrated with him (by tradition, Bob and Francis celebrated their birthdays together on May 28, splitting the difference between the dates). 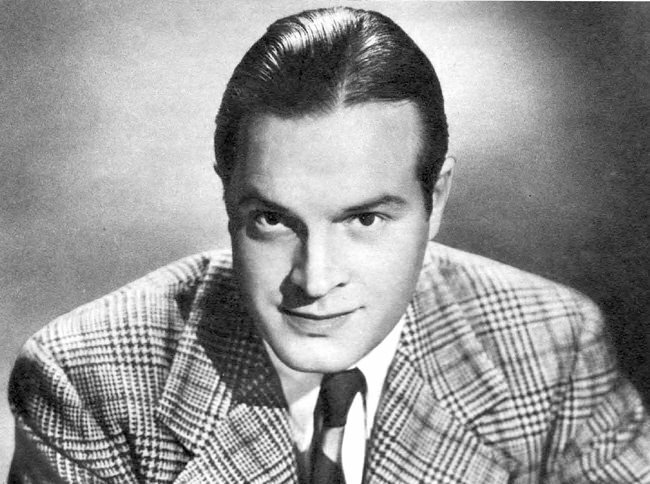 The intersection of Hollywood and Vine was named “Bob Hope Square” and 35 states declared “Bob Hope Day”. Two months later, Bob contracted pneumonia. On his deathbed, his family asked where he wanted to be buried. He turned to Dolores and said “Surprise me”. He was interred at the San Fernando Mission Cemetery in Los Angeles in the Bob Hope Memorial Garden. In 2011, Dolores joined him, she was 99. A Star on the Hollywood Walk of Fame at 7021 Hollywood Blvd honors Dolores Hope’s contributions to Live Theatre. 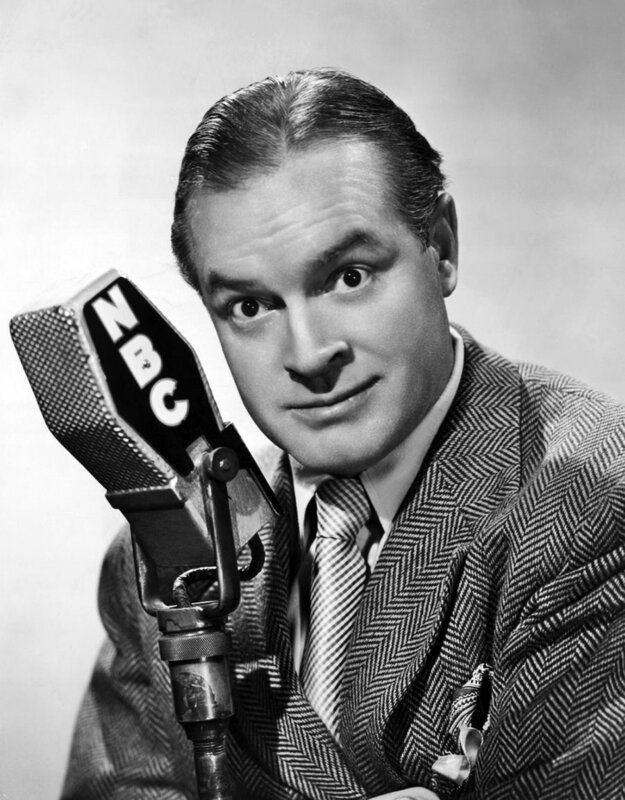 The star is co-located with Bob Hope’s Special Plaque for the same category. The Bob Hope Show was similar to the Bing Crosby Show. Like Crosby, he came to radio early and stayed late. He shared with Crosby an ability with words, a glibness, a keen intelligence. They did not however share their styles. Crosby on the air was slow and mellow: Hope was a machine gun, constantly firing off jokes. Showcased in the show were the likes of James Melton, Jane Froman, Jack Kirkwood, Rhonda Fleming, Patricia Wilder, Betty Hutton, Johnny Mercer, Maureen O'Hara, and Frank Parker. The Pepsodent Show with Yehudi became intertwined with Sherlock Holmes and Dr. Watson but all along, Hope was definitely the star. No one had ever told jokes quite like Bob Hope. His monologues were rapid-fire blasts of comedy, extremely topical and wildly appreciated by all of his audiences. the comedy topics age quite well,and are still very funny.just insert another name in lou of who is named in the show.his shows are timeless. 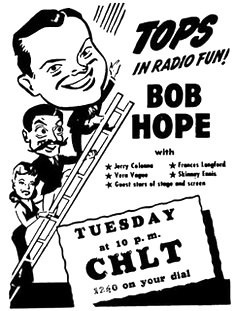 Bob Hope, shows are always creative and spontaneous. Lux Radio 411229 332 Bride Came C.o.d. Bob Hope 531009 569 Jack Buchanan Douglas Fairbanks Jr.